Last night, Jo Boaler (whose work I've written about before) took to Twitter (welcome, Jo!) to share details of "harassment and persecution" regarding her research, which she has written about on Stanford's website (PDF). Those in the math community had some understanding that this had been going on, and I applaud Boaler's decision to bring it out in the open. Instead of the first result pointing me to Boaler's 2008 article in Teachers College Record, I'm instead pointed directly to the Bishop, Clopton, and Milgram paper at the heart of this controversy. As Boaler has pointed out, it has never been published in a peer-reviewed journal. But it is published, in the modern sense, with perhaps something more important than peer review: a top ranking on Google. 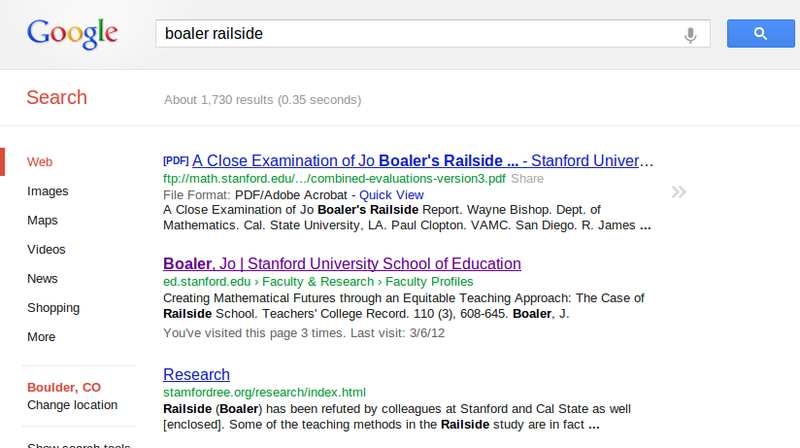 The second link points to Boaler's faculty profile, through which a couple of clicks will take you Boaler's self-hosted copy of the Railside article. I'm linking directly to it here not only because it's an article you should keep and read, but because it obviously needs all the Google PageRank help it can get. The third link in my search also refers to the "refutation" of Boaler's work, although the site no longer appears to exist. Why is Boaler's original work not easier to find? 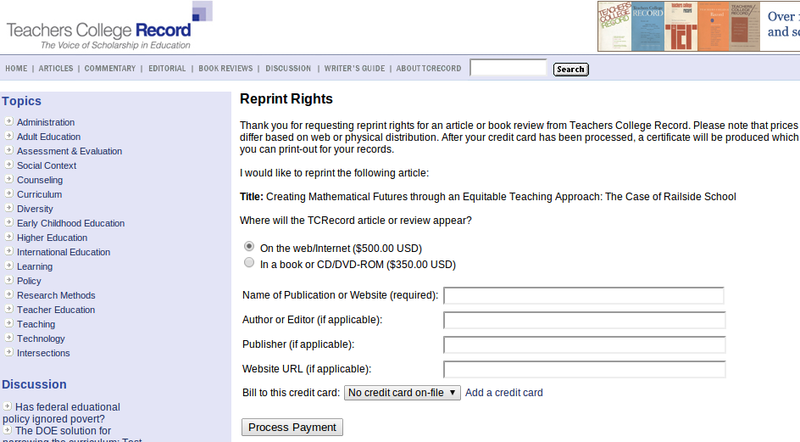 Let's look at the Copyright Agreement of the Teacher's College Record. According to TCR, it is their policy to "acquire copyright for all of the material published on TCRecord.org" and that such a policy "is designed to promote the widest distribution of the material appearing on TCRecord.org while simultaneously protecting the rights of authors and of TCRecord.org as the publisher." For TCR, this "widest distribution" means putting the article behind a $7 paywall -- not an extravagant amount, but enough to keep most people from reading the work, which means not linking to it and not elevating its search rankings. 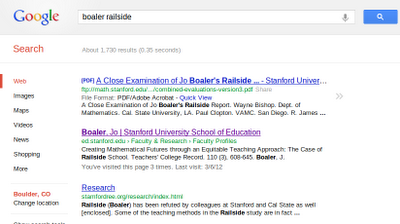 (A search in Google Scholar, however, returns it as the top result.) Given the attacks on Boaler and her scholarship, has this copyright policy been "protecting the rights of authors?" In Boaler's case, it's obvious it hasn't. But then again, by signing over copyright I'm not sure exactly what rights TCR says she has left to protect. 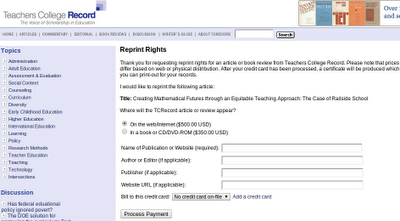 Yes, republishing the article costs $500. Is it worth it for me to pay out of my own pocket? Probably not. But is it worth $500 to the greater mathematics education community to have it more discoverable, searchable, and sharable? Given what she's went through, is it worth it to Jo Boaler? Yes, it is, and that's why encourage all authors to publish in open access journals or otherwise negotiate their copyright agreement to ensure greater rights over their own work, including the ability to post and share in ways that improve search rankings.